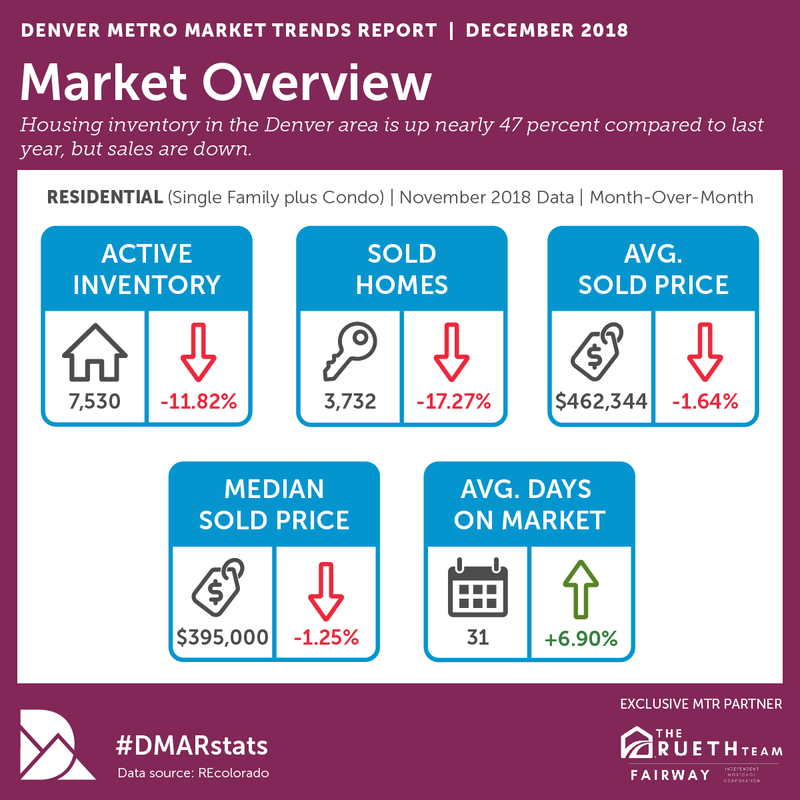 The latest Market Trends Report was recently released by the Denver Metro Association of Realtors for December. Here is a quick breakdown of some of the interesting data that I found important for home buyers and sellers in Denver. One fascinating statistic that stood out as I skimmed the report was the nearly 47 percent increase in housing inventory year to date compared to last year, but home sales were down. The number of homes sold in November 2018 dropped 23.6 percent compared to November of 2017, which year to date was a three-year low. Are these signals that the Denver and metro area market is stalling? There is an argument that the Denver market is cooling. On the other hand, prices are still climbing in Denver. The average sold price was at $462,344 which is up 6.47 percent compared to November 2017, but down 6.3% from the mid-year peak in the market. I think the normal seasonal slowdown is in part to the 6.3% drop. Digging a little deeper into the data we see that we are up 8.68 percent year to date compared to last year. As you can see, there are still bright spots in the market for home sellers. A piece of good news for buyers in Denver and the metro area is that Fannie Mae and Freddie Mac increased the conforming loan limit starting January 1, 2019 to $484,350. In the Denver metro area, the new loan limit will jump to $561,200. Another factor in the buyers corner is new construction inventory homes. The report revealed that builders in the Denver metro area have 941 ‘Quick Move-in Homes’ listed in late November. Typically, quick move-in homes or inventory homes have nice upgrades and builders want to get them sold before the end of 2018 to help their end of year financials. I think home buyers considering new construction should try to negotiate on price, builder incentives, and/or preferred lender incentives. I do recommend shopping the builders preferred lender to make sure it is a good value. 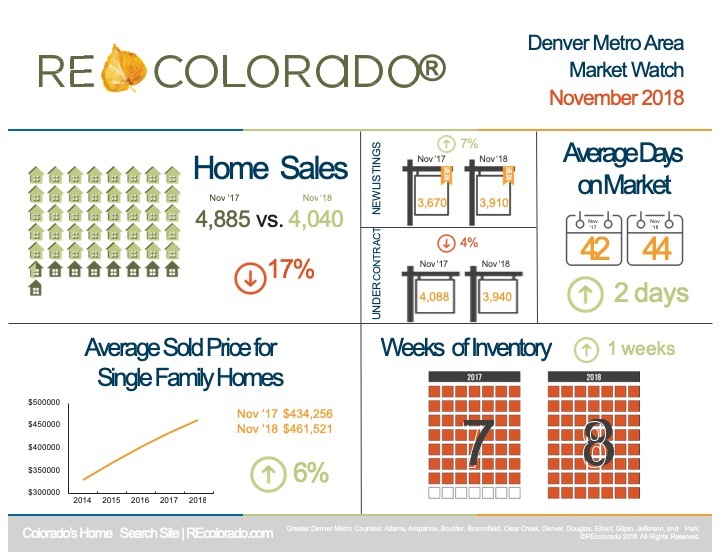 Here is an infographic from Denver Metro Association of Realtors with highlights from their recent report. In the Denver Metro Association of Realtors report one of the Market Insights was that “As the market appears to be evening out, buyers are starting to negotiate harder on price and inspection terms.” Time will only tell how the Denver market will fare in 2019. In my opinion, we will have to watch closely the impact of rising housing inventory and rates, which could be an indicator if home prices will continue to generate strong year-over-year returns. At the moment, the luxury market looks very interesting with increased inventory that signals buyers may be in the driver seat in 2019. The segment under $1 million still has historically low inventory, so home prices should see modest returns in 2019. Thanks for checking out our Denver Real Estate Market Snapshot.